Super “Art Mojo” Creative Contest!! enter fast! please read the blog above AND if you choose to enter follow Tracy’s instructions and leave her a comment at the end on your plans for 2015 and your email info. If you win give me a shout out!! Still 9 more days, enter for your chance to win…. Follow this link below to the http://www.goodreads.com site to enter this giveaway. It ends on Dec 1, 2014. Last Day: 2 ebooks of art & poetry reduced to just 99 cents! Sale ends tomorrow. This is the last day of my two kindle artist &poetry chapbooks that are on sale-reduced to just 99 cents!! Two people left reviews on Good Reads when they won a paperback version of this book. I was the lucky winner of this book from a recent GoodReads giveaway! Thank you! 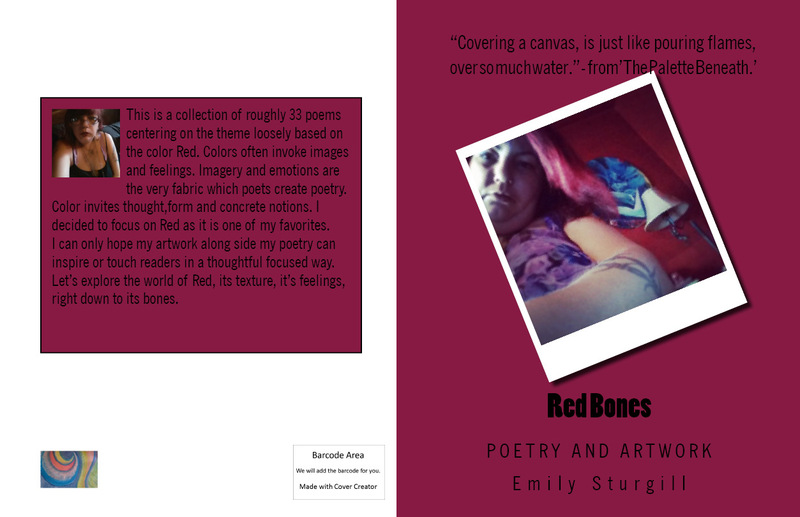 This book caught my eye while browsing the giveaway section for two reasons: first, I love the color purple (especially lavender); and two, I enjoy poetry and expressive art. Emily Sturgill delivers well on both points! (Of course, the purple cover was the easiest of the two. 🙂 I enjoyed her approach to some of her poems by stringing random words together into a coherent piece. I also appreciate how the author writes what she knows – bringing influences from her life and surroundings – and fills it with unhesitating emotion and honesty. My favorite poem is “Artist Cemetery”. It rings too true for my life. I enjoyed the style of the table of contents, too – so many TOC’s are straight-forward lines down the page, easy to get lost in or skip over, but Mrs. Sturgill even turns that into art, with alignments and indents that remind me of a gentle, meandering walk through the trees. However, the lack of page numbers throughout the book made it difficult to pinpoint a particular poem or piece of art without counting individual pages. Mrs. Sturgill explores many mediums in her art, and I especially enjoy the watercolors (“Watercolor Roses” and “Branching Out” being my favorites). A few of her emotive art pieces came out blurry, suggesting they may have been resized to fit the page and lost some of the detail and sharpness. A few poems also had punctuation I wasn’t sure how to read – I feel they contributed to furthering the artistic nature of the author’s work, but some extra slashes and commas made it a little harder for me to stay in the poem. 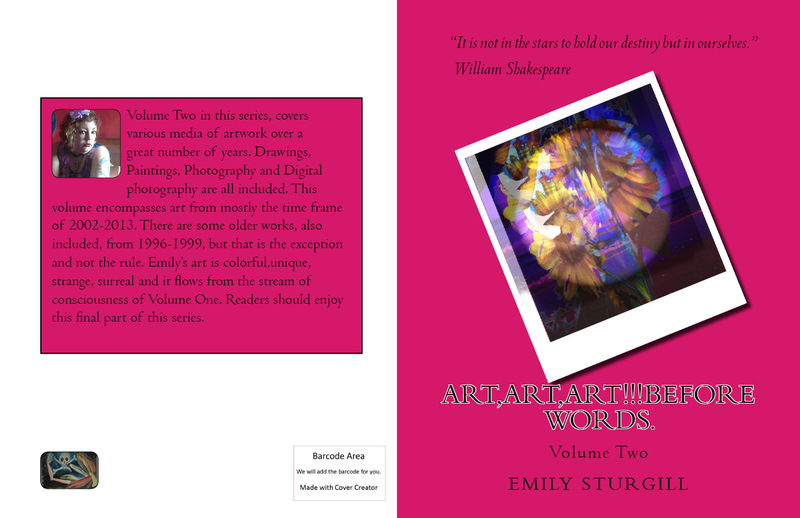 “Lavender Surprise” is the 7th volume in the new Artist’s Chapbbook Series, authored by prolific poet, artist, and mental health advocate Emily Sturgill; who promotes therapeutic art expression through teaching and social media. Sturgill is a graduate of Wayne State University in Detroit, MI. with a M.Ed in Art Education/Therapy. The recent economic collapse of Detroit, MI. had been widely covered in the media. The Motor City/Detroit filed for bankruptcy on July 13, 2013. In the poem “Artistically Inclined” Sturgill describes her experience of living in the impoverished area, trying to make a living on the Detroit 8 Mile, selling creativity Sturgill declares is worse then the (nostalgic) vacuum cleaner salesman. “Artist’s Cemetery” my favorite poem: it seems, could be much darker then it actually is. The artist’s depression seems mostly a frustration of being unable to change or improve situations with big government, drug companies, (available by expensive prescription only), and excessive (predatory) profits. The hopelessness of poverty and being unable to rise above it. The very short: “Lovesong” is a more upbeat expression of Detroit city life, and “Monster Lyrics” the joyful leaping of music sound. 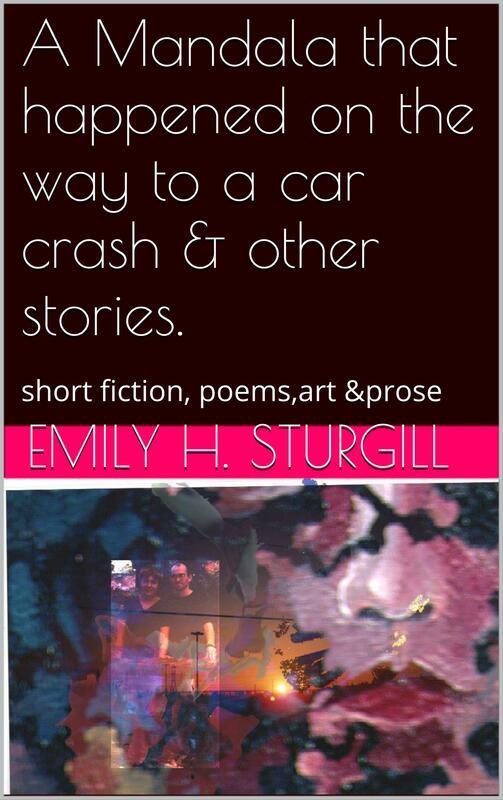 Sturgill often writes in a confessional style, many of the poems are light, short, surreal, yet upbeat. I received this book via the Goodreads First Reads program. The overall layout and design of the book is good. The poetry is heartfelt and the illustrations are interesting. However, the book could really benefit from the attentions of a proofreader or editor, as there are some typos and grammatical errors (including several in the author’s back cover bio). 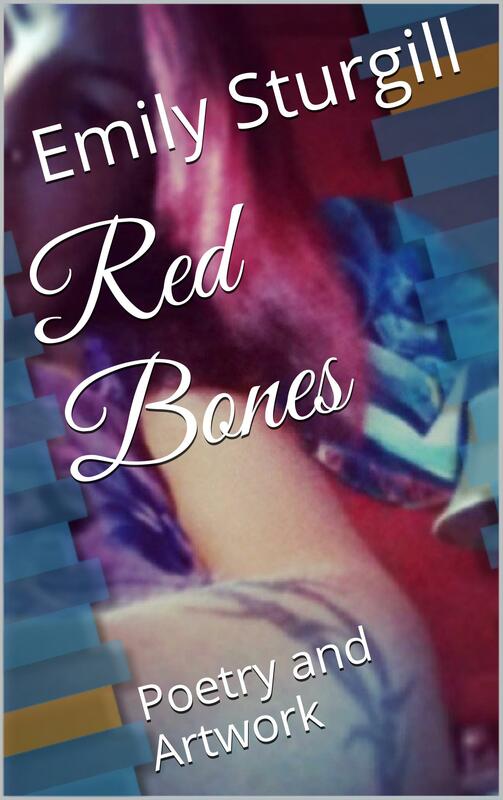 Emily covers several topics in the poems of this book; however, many of them have to do with her illness, Bipolar Disorder, which she is very open about in her poetry. She has a wonderful way of describing it to people who have never experienced the depression or mania of the disorder. She also seems to have a firm grasp on the essentials of living with the disorder, the stigma attached, and the feeling of being described as only your illness and not a human being with an illness being one component of your existence. Her poetry is a free-flowing eclectic style which takes you on a journey through her intensely creative moments of thought. Her poems are often free style and unique in their character. I had several favorite poems in this book including “Like Writer’s Block”, “Puddles of Poetry”, “Beyond Words” and “Grasping at Straws”. She covers the gamut of emotions that come along with this disorder as well as life in general, such as remorse, fear, pride, and love. Emily seems to have a very open mind and is willing to explore topics in a way that allows others to maintain their opinion while stating hers in a respectful way. 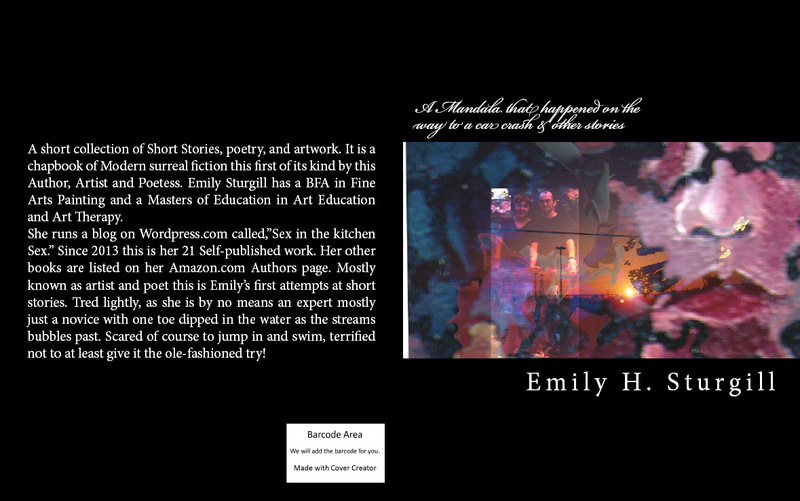 Her poems are very genuine and it is clear that they come from the heart. I would recommend this book to other people interested in Bipolar Disorder, depression, poetry, or unique writing styles in general. The artwork throughout the book is a very nice touch as well. This is clearly a very talented author and artist. I hope to read more of her books in the future! Two of my books are still available as free kindle promotional downloads! As always I highly respect getting comments, feedbacks or reviews on any of my works or on my blog! Thank you for reading this. This free deals will not last long so act quickly!